Wildlife lovers are jubilant as babies of estuarine crocodiles have emerged out of the eggshells in and around the crocodile research farm in Bhitarkanika national park in Odisha’s Kendrapara district. Over 500 crocodile hatchlings have so far broken out of the eggshells to make their way into water-bodies and water-inlets of Bhitarkanika national park. The rare natural phenomenon which is still in progress was watched by few ground-level forest staff. Forest personnel maintained safe distance from the nests as human interference turns the reptiles violent and aggressive. Fifty six crocodile nests were sighted in the wild this year by enumerators. Emergence of fledgling crocodiles sans mothers was a visual treat. Female crocodiles lay 50 to 60 eggs and the hatchlings usually emerge from the nests after 70 to 80 days of incubation period. The annual captive breeding of crocodiles’ eggs was suspended this year as the enclosure where ‘rear and release’ programme of these endangered species, takes place is being repaired. The eggs collected from the wild are hatched here artificially. Rear and release of these hatched reptiles has been going on since 1975, funded by United National Development Programme and Food and Agriculture Organization (FAO). The conservation project in Bhitarkanika tasted success while a similar UNDP-funded ‘gharial croc’ conservation project launched simultaneously in Tikarpada Sanctuary was a failure. Due care was taken by wildlife staff to prevent crocodiles’ eggs from being devoured by predators like snakes, jackals and dogs, found in the reserve. Adequate conservation measures by the state forest department have led to a systematic rise in the number of these reptiles over the years, claimed officials. 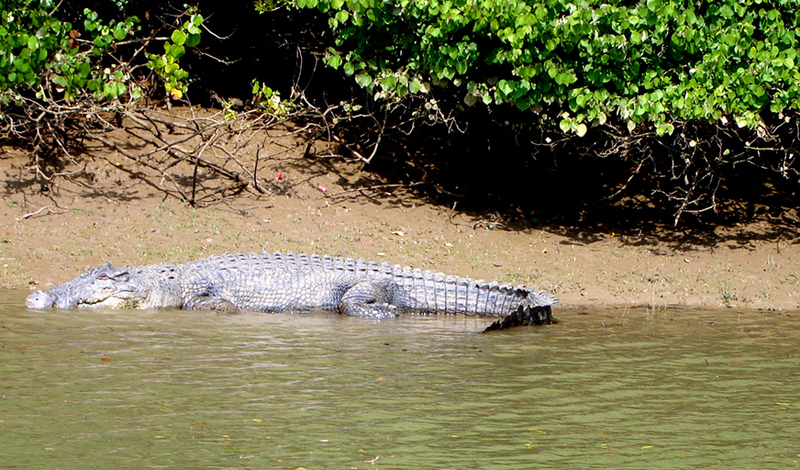 The number of salt water crocodiles, not found in any other river system in Odisha, stood at 1649 as per latest census in Bhitarkanika wildlife sanctuary.The wildlife sanctuary had been kept out of bounds for tourists and visitors to ensure disturbancefree annual nesting of crocs. The animals turn violent and restive over human interference in their habitat. The enforced restriction on entry to sanctuary was clamped on May 31 and it was lifted on July 31. Internationally acclaimed Bhitarkanika Ramsar wetland site continues to be the congenial habitat of salt-water crocodiles with the swampy mangrove-infested region housing the largest number of these reptiles. The region is criss-crossed by innumerable water inlets, creeks and nullahs all forming the part of Bhitarkanika river system. It’s now being claimed to be a record as nowhere in the country these species is spotted in such abundance.